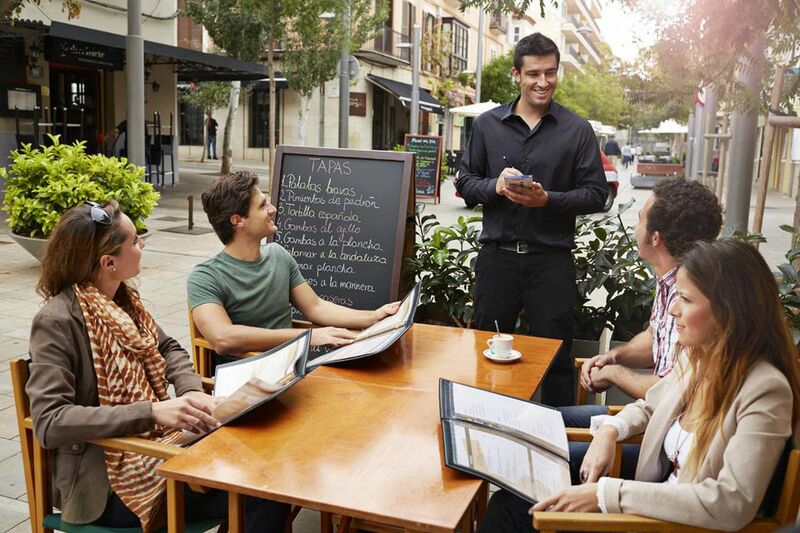 Spanish meals at home or at restaurants are eaten in separate courses. Whether it is a restaurant in Spain or in your neighborhood, you’ll need to learn to order from the Spanish menu, or as it is commonly called la carta. Start by reading the list of course names below that you may see on a menu at any Spanish restaurant, as well as what may be offered in each course. You will not see every heading listed below since there is a wide variety of ways to organize a menu. Menus also depend on the region, as well as the number of stars (or forks) the restaurant has been awarded. During the midday meal or la comida, the Menú del Día or Menu of the Day is generally offered and is the most economical way to eat at a Spanish restaurant. It normally includes a soup or salad, main course with a side dish and dessert—all for one price. It’s a great way to taste what the natives are eating in the region and it will probably include dishes that you would not have ordered if left on your own. This is also a good way to avoid having to choose from a long list of menu items. This is a small dish that may or may not be “finger” food. It is common to see sausages such as chorizo or morcilla (blood sausage), lomo (cured pork loin), jamón (ham), or queso (cheese) in this section. There will probably be a selection of both hot and cold dishes. You may or may not see this section on the menu. The first course is generally a lighter course, similar to the entremeses above. Soups and salads or sopas y ensaladas also appear in this section. These can include hot and cold soups, as well as asparagus Vinaigrette, traditional green salad, avocado or other types of fruit salads; however, normally these salads will not be sweet. The second course is the “main” course of the meal. In this section, you will see all kinds of dishes, such as cocidos/estofados or stews, asados or roasts, chuletas or chops, or grilled fish. Rather than list Primer Plato and Segundo Plato, the restaurant may list their dishes by type of food, such as fish, meat, etc. As you can see, not every restaurant will organize their menu in the same way. Sometimes, instead of listing the Primer Plato and Segundo Plato, or Carnes or Pescados, they may list all of the main dishes in this section. As the name implies, this section is going to contain the signature dishes of the restaurant, or what the restaurant is known for. This section usually contains only main courses. This section will contain the fish dishes and they will almost always be main dishes. Since Spain sits between the Atlantic Ocean and the Mediterranean Sea, there is a big variety of fish and seafood on any menu. Each region will offer different fish dishes. As with the fish section, the meat section of a Spanish menu will contain the meat dishes, whether they are beef, veal (ternera) lamb (cordero), pork (cerdo), or suckling pig (cochinillo) and they will be large, main courses. Dessert may be a simple offering of fresh fruit and cheese. However, Spanish desserts include a wide variety of ice creams, ice cream cakes, and sorbets, as well as custards such as flan, natillas, cuajada, or crema catalana. If you are at a true restaurant, not a café or tavern, typically you can request to see the wine list, as you would in the USA. There will generally be sections for each type of wine: Red Wine (Vino Tinto), White Wine (Vino Blanco), Rose or Claret Wine (Vino Rosado or Vino Clarete). You will probably also see a section for sherries or jerez. By this time, you are probably wondering which dishes to order because you now have the idea that you won't order one from each section! Let's simplify this: It is customary to order one dish from the Primer Plato, one from the Segundo Plato and Entremeses and Postres are optional, as is vino. Many times, if several people at the table have ordered salad, it is served in a large dish and placed in the middle of the table for everyone to eat. Here is short list of some restaurants that have their menus listed on the internet. Three of the restaurants are in Spain and one is located in San Francisco, California. Each menu is organized in its own way and there is truly a wide variety of dishes offered. Restaurante Meson el Cid, located in the historic city center of Burgos. Restaurante Virrey Palafox, elegant and well-known restaurant and hotel located in Burgo de Osma. This page contains an impressive photo gallery of dishes, as well as links to the seasonal menu and a separate dessert menu. The photos are outstanding. Patio Espanol, a Spanish restaurant in San Francisco, California.